Anyone who has been following our Facebook page or blog for awhile is familiar with the Breakfast of Champions layer feed mix that I concocted for our chickens to eat. It's basically a base of a good quality layer feed with some supplements mixed in. I mix it up 50 lbs. at a time and that involves scooping out portions of lots of different products, unscrewing tubs and opening bags, as well as storing the supplements so that rodents or insects won't get in. It was a bit haphazard to say the least - it was clear I needed a more organized method. 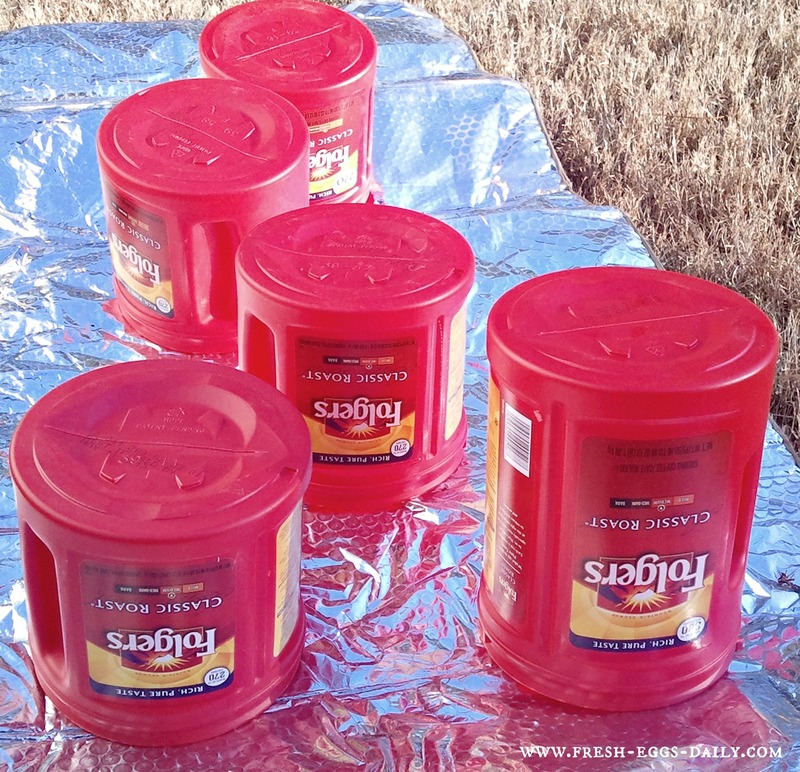 Knowing my penchant for crafting and reupurposing, my husband had been bringing home large plastic Folgers coffee canisters from work when they were empty. Unable to throw them out, but having no use for them, I realized they were starting to pile up in our garage. So....perfect! I knew what I would do with them! 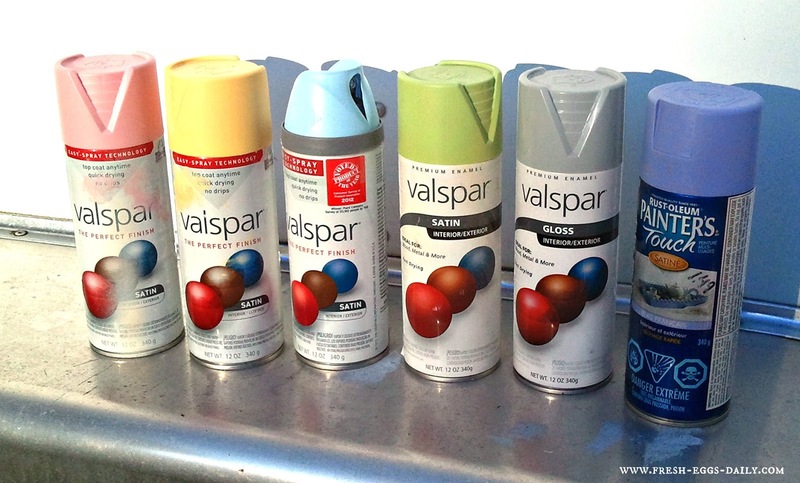 While the canisters were drying, I took an inventory of our pastel spray paint inventory in the garage. Excellent! A nice selection of colors at my disposal. Next each canister got two coats of spray paint. Then I left them to dry completely. Fortunately, I found these great custom vinyl decals from Oliver Photo Graphics which saved me from having to hand letter or paint the names on each canister. However, since the paint would have peeled right off with the decal tape, I did leave the clear tape on each label, but I think if you sprayed the canisters with a few coats of clear polyurethane, you could peel the clear top tape off with no problem. Of course the vinyl decals would work great on glass or metal, or even smooth wood. I am just happy that I now have my supplements all organized, it's a snap to pop the top off each canister, scoop off what I need and replace the lid. 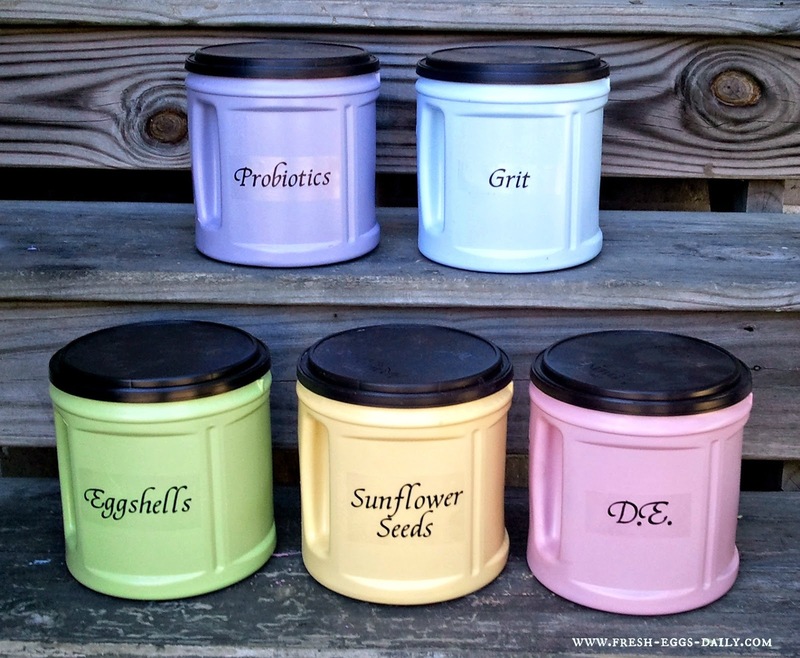 These canisters are rodent- and insect-proof and they also keep out moisture. They are so cheerful for spring and line up neatly in the tack room on shelves. Total cost for one batch that lasts our flock of 30 chickens and ducks about one week: $40. 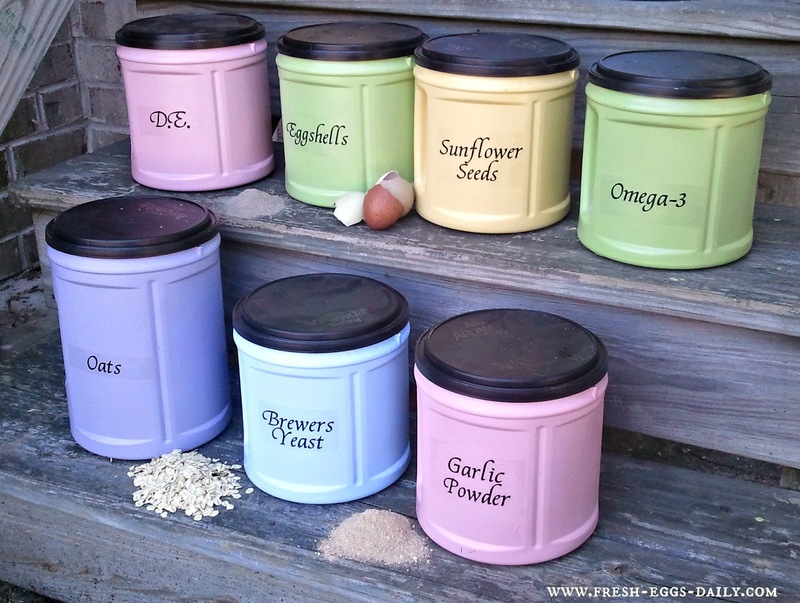 I also made canisters for grit and crushed eggshells, which I feed free-choice. And some more thoughts on mixing your own feed from scratch HERE. Great idea. I have similar empty containers to spruce up. Do you know what your Breakfast Of Champions end up costing you per 50lb batch? Thanks! You know I don't. I should cost it out. Since you're only using a few cups of supplements, the bags do go a long way. I'll work on that tho and try and add the costs to the post. Do you find it easier to open all of these every day rather than have one large (like a small aluminum or plastic trash can with a tight lid) container where your layer feed and the above are mixed at one time, then scooped daily? Right now I sort of have your system going (though not nearly as prettily!) and I'm looking to a one container system instead. Or maybe I'm misunderstanding! Sorry I guess it was a bit vague. 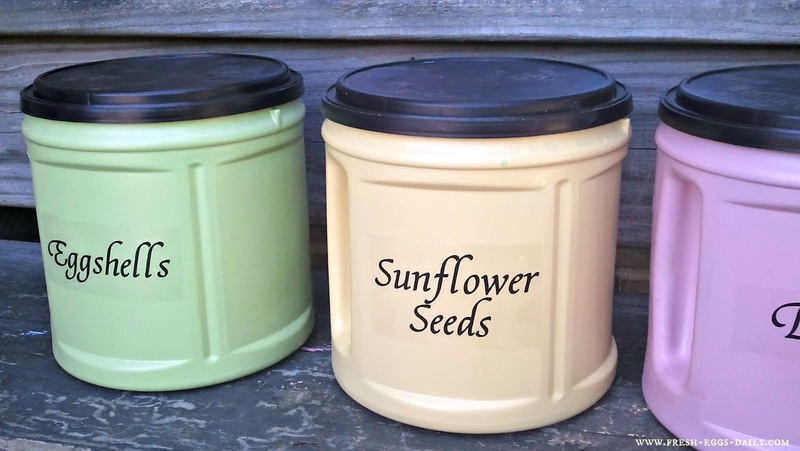 I do mix up a whole batch with a 50lb bag of feed in a huge rubbermaid tub at one time and then parcel it out into three plastic pails inside metal covered pails. I scoop out their daily ration out of the metal pail, which for my flock lasts about 2 days. I go through a 50lb bag/week roughly. But I was still left with partial bags and containers and they were messy AND mice were starting to eat through the plastic bags that some of the supplements come in. Beautiful! Still not sure if I'm ready to spend that much up front on feed. What are your top recommendations to start with? We only have 8 ladies right now. MJ - wouldn't some of those supplements, being smaller or lighter than the others, tend to settle to the bottom of a one-container system and be less thoroughly incorporated over time? I mix up a 50 lb bag at a time with the supplements and they really don't seem to settle much, but I use crumble which seems to 'hold' the powders a bit better. I do however stir the mix up before doling out. I've just discovered your blog and am really enjoying it. Thank you. I'm new to raising chickens & guineas and am learning a great deal. Most of the ingredients make sense to me, but could you please explain why you add yeast? These look great however, are you worried about the chemicals in the paint and the BPA in the plastic getting into your food? The paint doesn't come in contact with the supplements. As for the canisters, they are food-grade containers since they had coffee in them for human consumption. In the whole scheme of things, and considering what there is to worry about in life, honestly no. Most of the supplements come in plastic containers or bags in the first place. 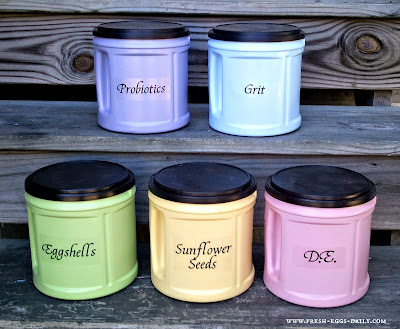 This is such a cute idea to use up those plastic coffee cans. It looks so organized and pretty on the shelves. Saw this at Cowgirl Up Tuesdays. Interesting idea. 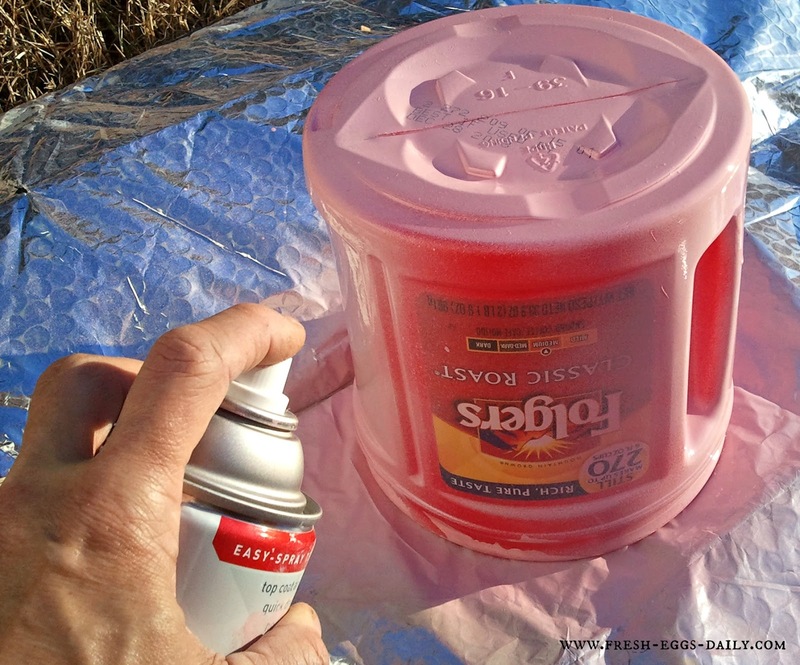 I use empty cat litter containers.....never thought about painting them to make them look nice. Might have to try now. LOL! 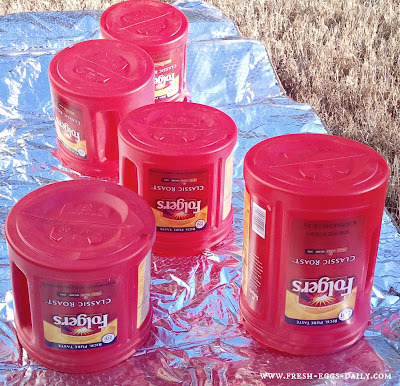 I have one of the vacuum sealers that I use to seal my dry items in regular canning jars using regular canning lids. I love that because it's glass...no worrying about the plastic issues. 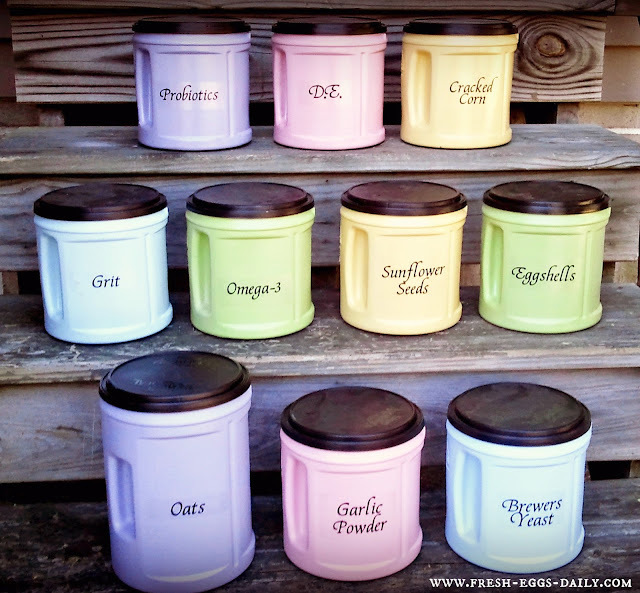 And I also love the look of canning jars on a shelf. Have you seen the jar sealers? They vacuum seal a regular or wide mouth canning jar. When you use the item you just pop the lid off, take out what you want, then you can use the same lid to re-vacuum. 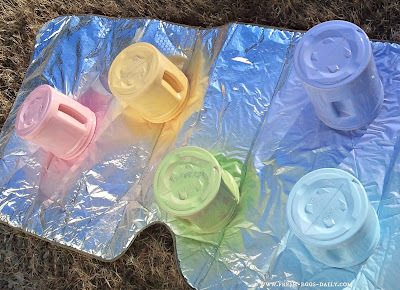 I learned about those about 2 years ago and I bought a vac sealer just to use the jar sealers! 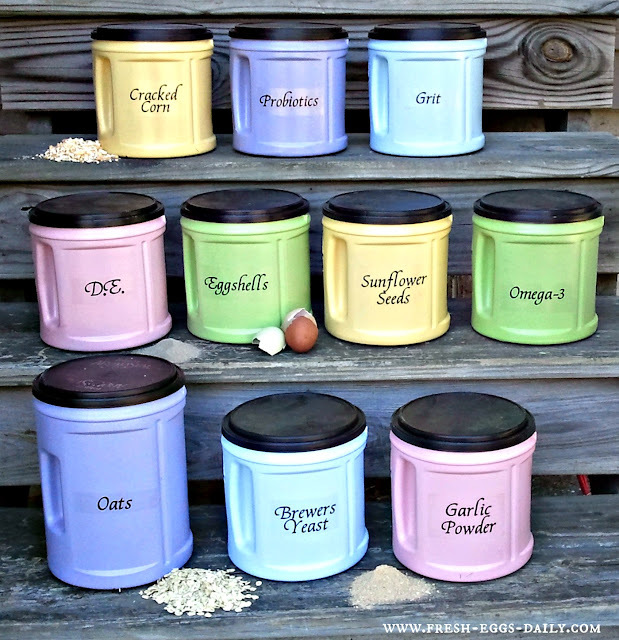 I use it a lot and it extends shelf life of items like grains, chocolate chips, dehydrated fruits and vegs, etc., for long-term storage. I love, love, love this thing - I think the attachments were about $7 each for the wide mouth and the regular mouth. Here are a couple videos showing them: http://www.youtube.com/watch?feature=player_embedded&v=fhb1gfVSB9Y#! This is genius! I love it. My stuff is just in every extra container and I love the idea of A) being able to stack them neatly and B) having them look organized and clean. The are so stinkin' cool! I have about 8 of those in the garage - I kept thinking they would be good for something but I never could figure out what. Now, I (thankfully) don't have chickens anymore - I grew up with over 100 of what are now called free range chickens - we called them layers and sometimes Sunday dinner - but you just gave me a fantastic idea! Those will be painted and labled for all my crafts stuff. Thank you so much! I found you on I gotta' try that party and I've pinned! My husband brings coffee cans home for work to put in our recycling bin. I might have to snag a few and start using them for storage. I want to thank you for the recipe. I have 6 - 3 week old chicks. I was thinking of starting them on this "Breakfast of Champions", only I was going to substitute the layer feed with chick starter. Do you think this would be a good idea? Sure you can do that. 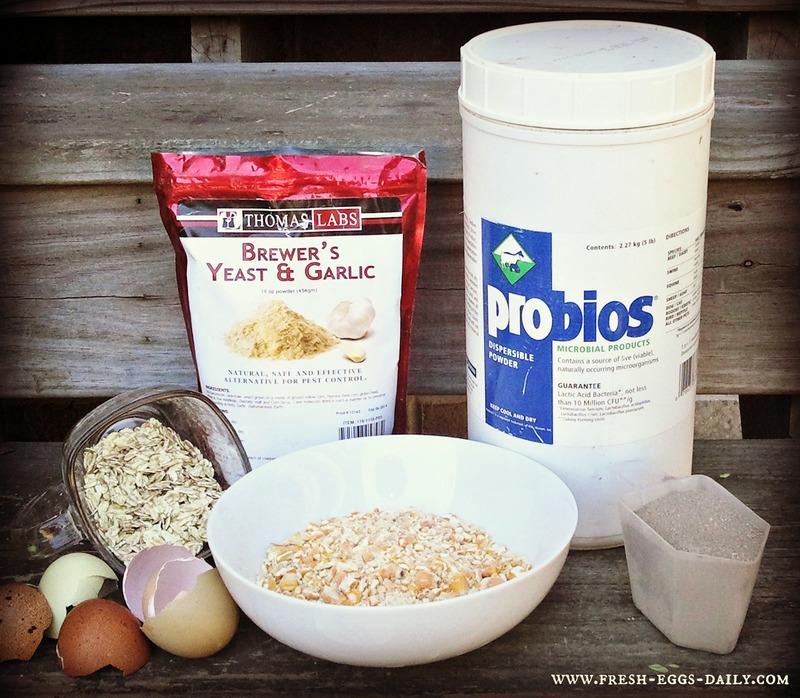 I do give my chicks the probiotic powder and garlic powder/brewers yeast, but just a sprinkle on top of their feed. I would skip the Omega Ultra Egg and DE for now. The DE they won't need until they go outside and could be in contact with worms and other parasites, and the Ultra Egg they won't need until they start laying. So yes a modified breakfast would be perfect ! how many chickens are you feeding? I have mine in Double Bubble bubblegum canisters, now I think I'll run get some spray paint in my favorite colors. I only have 16 chickens all under 4 months old. it's additionally thought that allergens area unit unbroken within the bag and is additional contained once ever-changing, which can be additional of a priority to those with allergies to dirt particles and pet dander, for more information visit here http://canisterfilterexpert.com.